The Sun awards is usually associated with trends, glamour and style. 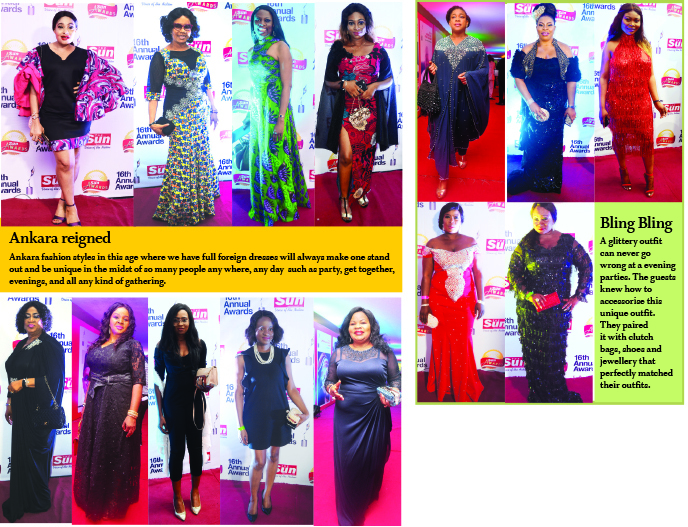 In fact, at the recently concluded awards event, it was a show season full of trendy fashion. Guests, especially women, were spotted in current fashion trends at the event. Some of the styles include, ankara mixed with English fabric, high-low dresses, prints, exaggerated sleeves, natural hair styles and jump suits. Others were trendy colours, such as green, pink, purple, yellow, orange and so on. Floral dresses, one shoulder dress, high slit dresses, fringes, all white attire, little black dress, and cold shoulder otherwise called cutout, were styles of the moment. In keeping with the trend also, most stylish women were seen spotting trendy shoes such as peep toe, ankle strap, platform and pump shoes, clutch purses and earings. Below is how celebrities wore and paired their perfectly chosen mix of trendy and classic clothes and accessories.